Shortly after the founding of Detroit in 1701 a village of Ottawa Indians was established on the south shore of the river in this vicinity, and its inhabitants lived on friendly terms with the French garrison and settlers. However, after the British took control of Detroit and other western posts in 1760, relations with the Indians deteriorated. In 1763 the great Ottawa chief, Pontiac, raised a strong confederacy of Indian tribes and attacked several British posts. 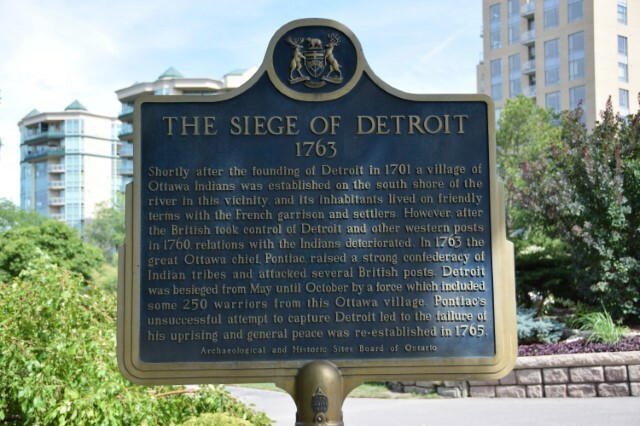 Detroit was besieged from May until October by a force which included some 250 warriors from this Ottawa village. Pontiac's unsuccessful attempt to capture Detroit led to the failure of his uprising and general peace was re-established in 1765.